Nowhere is this more apparent than in the terminology used by animal exploitation industries for the products they promote to “conscious consumers” to get them to spend more money on the same suffering and death. Terms like “cage free”, “free range”, and “grass-fed” sound great and look even better on a carton of eggs or the wrapping of a steak. They evoke images of rolling green pastures on a small, family-owned farm and the romanticized agricultural practices of earlier rural society where all the milk came from your next door neighbor, several miles down the dirt road. We’ve all seen these products, often proudly offered by co-ops or in the “health” section of chain stores. The marketing departments of these companies have read the changing perspectives of consumers as more information has come to light about the true practices for of raising, confining, and slaughtering animals for human consumption. As a result, they have begun to repackage and rebrand their offerings to suit the latest ethical considerations. Unfortunately for consumers, the planet, and especially the animals, these changes are superficial at best and euphemistic lies at worst. What follows is information about a variety of terms currently in use, what they’re meant to imply, and what they actually mean in terms of farming practices. Cage free eggs are currently all the rage, as Americans consume roughly 76.5 billion eggs annually. The horrors of the egg-laying hen industry, especially of battery cages—tiny, stacked wire cages which house multiple hens in crowded, filthy, dark, and agonizing conditions for the duration of their short lives—have been exposed thanks to undercover investigations and the national media. “Cage free” sounds like the hens are able to walk around, enjoy open spaces and sunlight, stretch their wings (impossible inside battery cage confinement), and perform natural habits like pecking and scratching at the dirt. The reality? While the birds indeed live outside of cages, they are still crammed on top of each other in filthy spaces. Because the overall purpose of all animal agriculture, be it small scale or large, is to produce the most profit from the smallest investment, utilization of space is crucial to keeping overhead costs low. Some of these buildings have natural lighting sources, but these openings are more often than not for the benefit of the workers who have to wear masks in order to prevent breathing all of the feces and molted feathers in the air from these stressed, often sick birds. Cage free hens still come from the same hatcheries as those kept in battery cages. This means that all of the male chicks, who cannot lay eggs and are therefore worthless to the egg industry, are killed shortly after hatching. Cage free farms also perform debeaking on the hens, which is a process of cutting off the tip of the hen’s beak in order to minimize the amount of damage they can do to each other while confined and under duress. And just like battery cage operations, these birds are still killed at a young age—usually around two years of age, shy of their ten year average lifespan—once their production begins to slow. Because of the way these birds have been selectively bred over the years, they produce far more than the natural one egg a month and all of that extra stress on their body depletes the vital minerals from their bones and causes them to become ill and lame. While inspiring much the same images as “cage free”, the definition of “Free Range” is a system of animal processing where the animals are allowed access to outdoors instead of being confined indoors 24 hours a day. However, there is a major loophole in that the animals may be confined for matters of safety, public health, or depending on the stage in the animal’s development. So instead of happy chickens taking sunny dirt baths and perching on fences, the reality is far bleaker. Most “free range” operations are the same big, filthy, crowded sheds complete with all the other standard practices in the industry, except for a small opening to a small outdoor pen. Usually these outdoor spaces are even less cared for than the indoors, as a deterrent to animals actually entering the outdoor pen. Confinement is efficient and this industry is a business that treats living creatures as though they were machines for our use. Efficiency makes a profit. Going out of the way to provide animals something resembling a natural life does not. One of the biggest concerns for environmentalists who still want to eat the flesh of cows and other animals is whether or not the animal was able to graze naturally, on some idyllic Midwestern farm with daisies and clover growing in the background, or if the cow was fed mass quantities of grain on a feedlot (known in the industry as a CAFO, or Controlled Animal Feeding Operation) in order to grow at an unnatural rate. Most people now know that these large scale industrial feeding operations create incredible harm to the environment, largely to do with the incredible amounts of excrement produced by the animals housed there and the resulting runoff into waterways, which create aquatic dead zones and destroy wetland ecosystems. The other major concern is the level of greenhouse gases, including mass quantities of methane which is significantly more effective at trapping surface heat in the atmosphere than carbon dioxide. 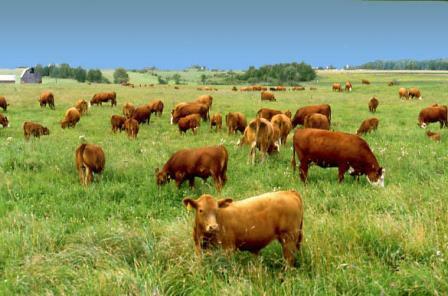 Of course, the cows also produce carbon dioxide, since they are breathing just like any other animal. So is grass-fed beef more sustainable? Not exactly. For starters, there simply is not enough viable grassland on the planet to support the levels of consumption in the United States alone. Not even close. Cattle ranchers are already using public land, subsidized by the government, to graze herds and this destroys these delicate ecosystems that cannot support the extra weight of massive herbivores foraging en masse. This need for more space leads to further deforestation—raising cattle and growing large monocultures of soy and corn in order to feed them are already the leading causes of loss of rainforest in the world—leading to more ecosystem collapse and amplifying the effects of greenhouse gases, with less trees available to replace the carbon dioxide with breathable oxygen. Not only does grass-fed beef not address the issues of raising large mammals for consumption, it is also a bit of a misnomer. While these animals may start their lives grazing on grass and alfalfa, almost all of them are “finished” by being fed grain on the same feed lots as conventionally raised cows. Since there is little to no regulation for the labels applied to processed animal carcasses, these companies can say whatever they want to make the consumer feel more comfortable with their purchase—and they can charge a premium for it. It’s hard to shop anywhere without seeing a lot of products labelled “organic”. In terms of produce, organic fruits and vegetables are non-GMO, grown without chemical pesticides and fertilizers, and encourage biodiverse crop rotation and natural farming practices. While some of these regulations translate to organic animal farming/processing, such as not using GMO feed, antibiotics, or growth hormones, it actually has little effect on the way the animals are treated. While it is recommended that organically raised animals are given the opportunity to live as natural a life as possible, the vague language and enforcement exceptions for industry standard practices make this improved treatment more theoretical than practical. Regardless, the organic certification gives many consumers a false sense of confidence that they’re buying from farms that will treat their animals kindly and in many cases, it’s hard to distinguish between the two. Most organically raised animals still end up in the same large-scale industrial slaughterhouses, providing a painful and terrifying end to their short lives. There is an organization now granting “official certification” for animal processing companies that wish to market themselves as humane. While the organization claims to require a set of strict care guidelines for these operations to be approved, they still ignore the fundamental question: can the breeding, raising, owning, manipulating, controlling, exploiting, and slaughtering of another sentient being ever truly be humane? After all, we would not wish these things done to us, or to those we care about. Shouldn’t that be the guideline when it comes to the treatment of animals? Even if all of the euphemistic language painted an accurate picture of the lives these animals lived, at the end of the day, a “humanely raised” pig is still going to be violently killed against his or her will as soon as they are large enough to make the most profit. A “humane milk” dairy cow is still going to be forcibly inseminated year after year, have her babies taken from her, and be slaughtered as soon as she no longer produces enough. Whether the farm is a massive industrial operation or a small backyard chicken coop, at no point are these animals free to be in control of their lives. The humans who own them have already decided their expiration date the day they are born. There’s nothing “humane” about that. There’s nothing “free” about that. There’s nothing “compassionate”, “happy”, or “cruelty free” about that. If you care about the well-being of animals and the planet, and want to support companies that are truly trying to do good in the world instead of covering up all the bad with flowery poetry, you have one option. Go vegan! Want help? Go to www.aimalrightscoalition.com/veganuniversity for information on mentorship programs, nutrition classes, grocery store tours, and a number of other great, free resources to make the transition toward compassion as easy as possible.